I can do no better than repeat least year's opening lines - our second independent exhibition "would have to be judged a riotous success by any measure!" 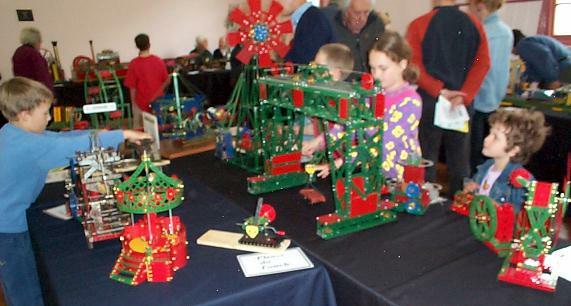 This year we were fortunate in having good weather on our side, our publicity efforts were greatly more successful than last year, we had one or two more exhibitors, just a few more models and quite a lot more visitors it would seem. With nearly 400 paying visitors (children were free) we must have attracted rather more than 600 or 700 people all told. All day long both the church and the hall were well packed, the crowds tapering off a little only through lunchtime and towards the end. Even by our earlier 9.30 am opening time people were literally waiting for us to open. Our publicity this year was a great improvement on last year. Over a quarter of our visitors heard about us via radio, 90% of them on 3LO/774. Another quarter learned from flyers distributed via hobby shops, other related exhibitions and local postings - Jack Parsisson did a great job in keeping these outlets supplied over many months. Newspapers provided another quarter where Paul Johnstone's article in The Age some few months back dominated. The remainder was made up of MMC Inc. members, friends, relatives and miscellaneous sources - five visitors even learned of us via our website! 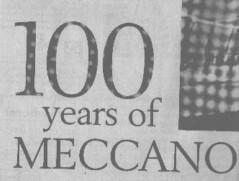 I would like to thank all who contributed, in whatever capacity, to this Centenary Exhibition - you can be proud of being part of what was, without doubt, our most successful exhibition to date. I would also like to thank this year's Exhibition Committee for its unstinting help, generosity and support in all that went before this Exhibition. It is astonishing just how many small items have to be attended to - even though, since we've done it all before, you might think that there's little new to worry about - I assure you, that just ain't so! 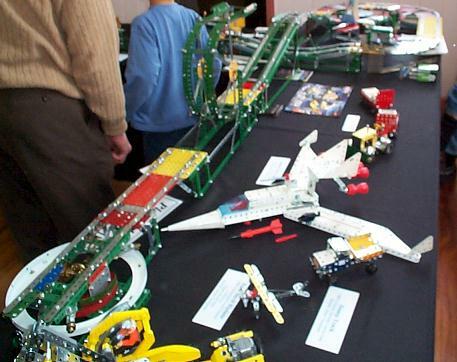 Our displays are detailed elsewhere in this Newsletter. I was a fraction disappointed in the overall response however - as was the case last year, only a third of our membership actually contributed to the display. Perhaps this is a good fraction of our membership, I don't know. I had hoped that it would be a little higher this year, that's all. We also had great difficulty with volunteers for door duty - quite the opposite of last year. Why? In the event some exhibitors, and some wives, made up the shortfall and saved the day - but we really shouldn't have to stretch to that. I do hope we can do better on both fronts next year. We had 38 members attending our second independent exhibition on a much better day than last year - cool with some sunny spells but fortunately little rain and wind. 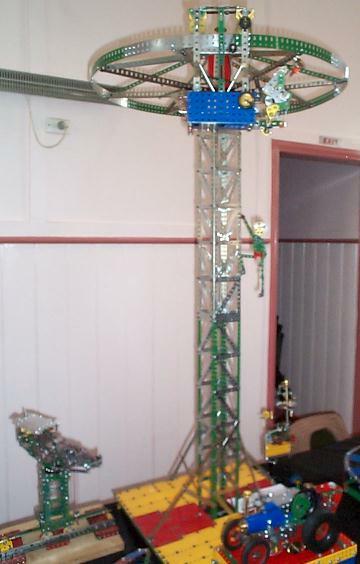 Once again Graham Jost had his Australian Windmill operating in the porch where it could be seen from the street. 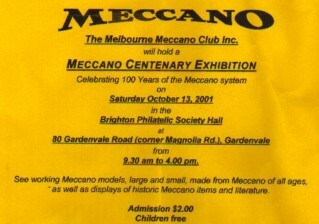 This together with our fine banners (donated of course by Jack Parsisson) strung along the outside fences clearly showed to passers by that there was a Meccano Exhibition on. Inside the Main Hall, Bruce Douglas had once again done an excellent job of decorating the walls. 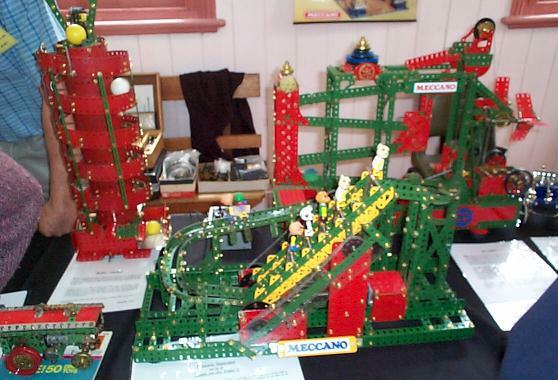 This time it was covers of Meccano Magazines from Issue No 1 through to the end of 1940. These provided a magnificent display and I noticed many visitors admiring it with considerable attention. 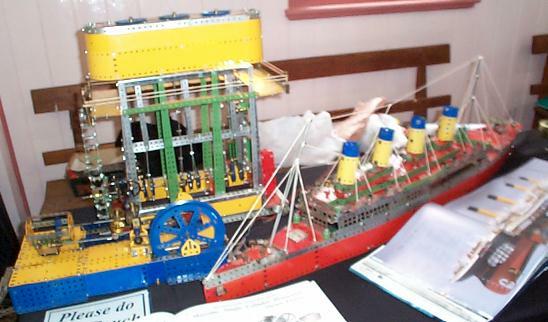 You certainly do a fine show with your displays of Meccano literature, Bruce. 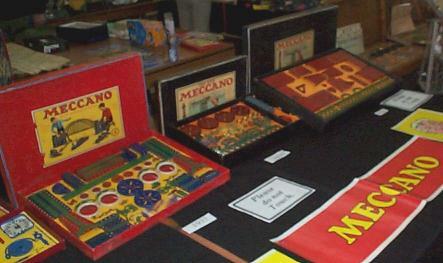 A further historical display had been put together in the Main Hall by Tony Press. 1915 No 6 Outfit all nickel in wooden box with Xylonite lid over the Wheel compartment and green baize lining. 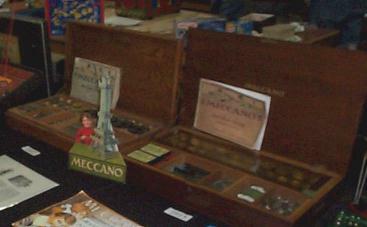 1922 No 6 Outfit all nickel in wooden box - the last time No 6 was the largest Outfit. 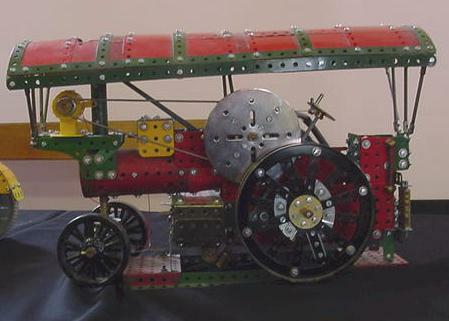 1926 No 5 Outfit 'The New Meccano' with the top layer painted cherry red and apple green all other parts still nickel in cardboard box. 1932 No 3 Outfit in dark red & green. 1937 No 4 Outfit Colonial style in red/green/blue. 1937 No 1 Elektron Outfit. 1917 American 4 Volt Electric Motor with no cutouts and redesigned field. Tony's display provided an opportunity for a trip down Memory Lane for a lot of our visitors I personally had interesting discussions with several people. Tony Press also had his Bondi Tram (acquired at a Club auction last year) on display. 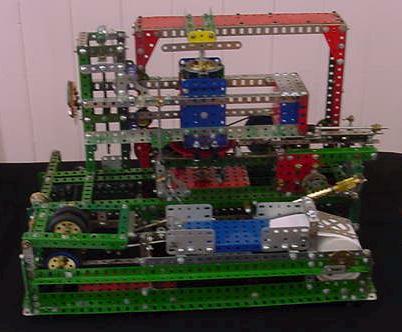 This was running on about 1.5 m of Meccano track with overhead conductor constructed using long lengths of Meccano axle rod. The technique used to attach the rod to the brackets which support it from stanchions is a very ingenious AP invention. Street lamps (in Meccano of course) and a bench (from the 1970's No 1 set) for waiting passengers to sit on completed a very attractive layout. At the far end of the hall Jim Osborne had his Sydney tram running sedately back and forth along a 4 m track. Despite being more mechanically elaborate than Tony's it operated faultlessly all day in the hands of several drivers. Jim's tram has trolley poles at either end which are raised and lowered at the end of each run as required, by electric motors. In the middle of the hall, quite literally towering above everything else was, Graeme Thomson's Grandfather Clock based on the Bert Love design for the No 10 set. The clock kept excellent time throughout the day - no mean feat since the floor of the hall slopes so that Graeme had to carefully level the clock. Graeme is one of our newer members and has returned to the hobby after a break of many years. Not a bad start. 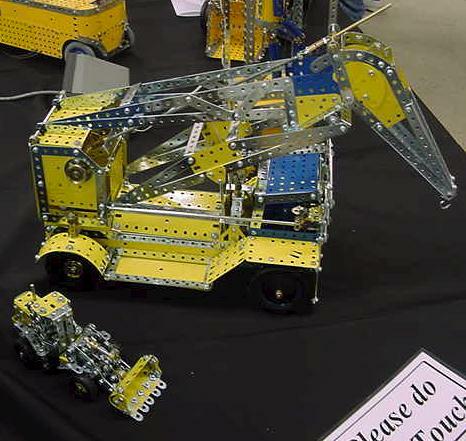 Willem Sekker provided a Motorised Excavator, an Overhead Gantry Crane (both from Evolution 5 Set) and a small Breakdown Truck. 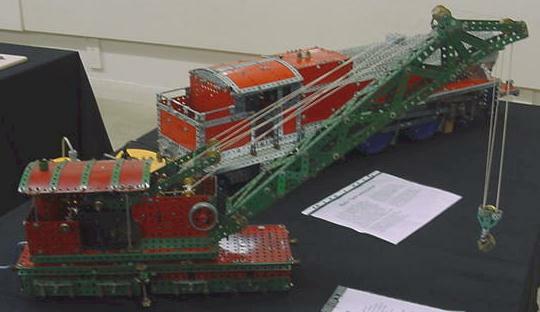 Bill Fitzgerald had his Baltic Tank Locomotive (SML 15) and Railway Breakdown Crane (SML 30) on display. The former was set up for continuous operation of the driving wheels. I was interested to observe how many people intently studied the piston motion and valve gear in operation - I have always found this very fascinating myself. Tony Van Wageningen provided three smaller models, a Rotary Hoe and a Lawnmower from the Evolution sets and a more conventional Field Gun. 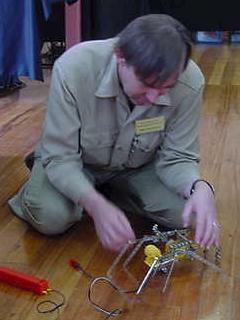 John Brand showed off several models from set manuals including the Sydney Bridge (R/G), two examples of trucks (one blue/green, the other yellow/Zn) from the No 5 R/G manual, Seaplane (yellow/Zn) from the same manual. 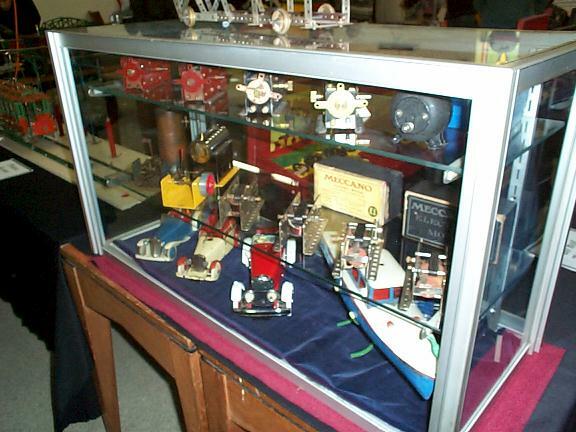 He also had a display case of some less common parts. Further along the table John Riley had two models in yellow/zinc, the Forklift from the No 9 R/G manual and the Front End Loader from the No 10 manual. Lindsay Carroll had his marionette dancing away merrily throughout the exhibition. 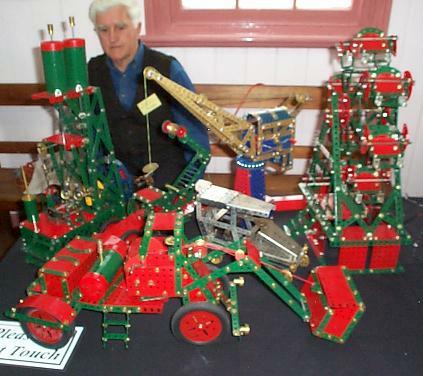 His other exhibit was the Jumbo Crane from the 1970's No 8 manual - a hopeless model according to Lindsay. It looks nice but does not demonstrate "correct engineering principles". 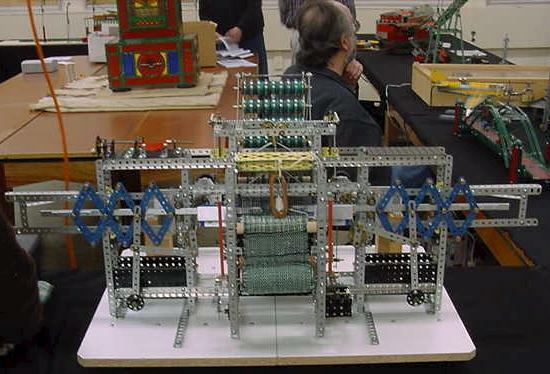 Patrick Russell-Young was demonstrating his Meccano Loom weaving a coarse cloth of variegated colours - green, black and white. 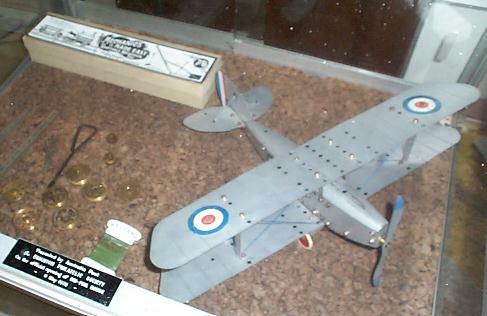 Next was Roger Hall's display of a wide range of models from some of the French one model sets. 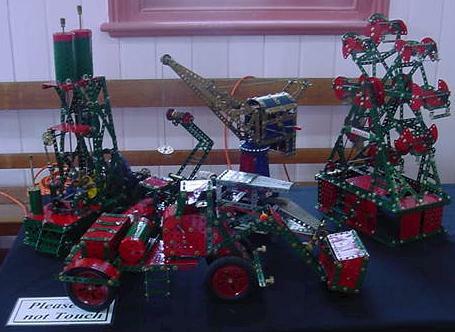 As well he had some examples of models in red/green from the smaller Binns Rd outfits. 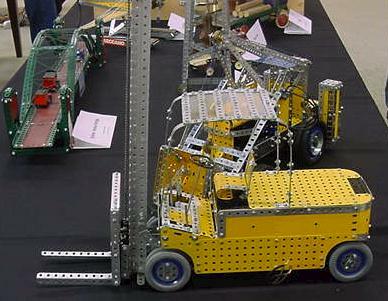 Two larger models were from 1970's Multikits - a crane from the Crane Set and a Breakdown Truck from the Highway Set. Sandra Hall was our only lady exhibitor and showed off several models from sets including a sewing machine from the 1970's and a lawn-mower from the Evolution Series No 40 set. As well she had a free-lance model of a cat with an appealing face. 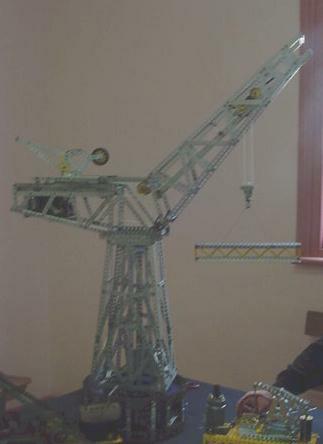 Hammerhead wharf crane based on a Marklin Manual model of about 1954 (Set 105 - roughly equivalent to a No 10 Meccano Set). 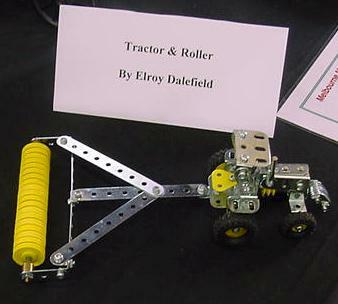 Farm Tractor from a model leaflet published by Meccano about 1962 to publicise some of their new parts and colours. 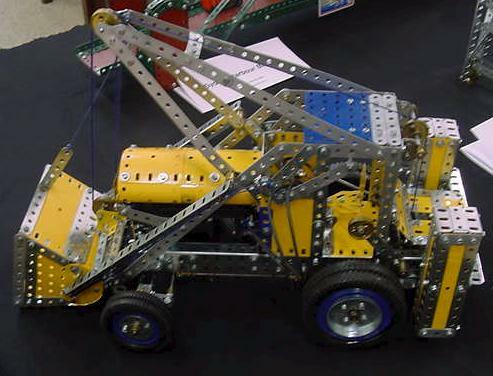 Trench Digger/Excavator, based on a design by Geoff from the Meccanoman's Newsmag No 25. 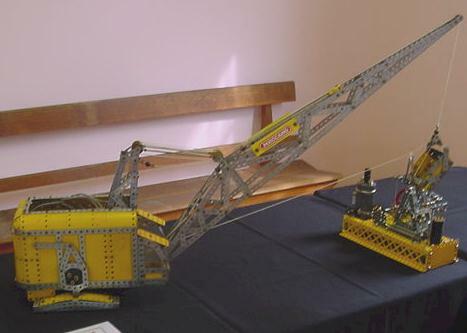 Giant Walking Dragline built from instructions in the Dec 1954 MM. 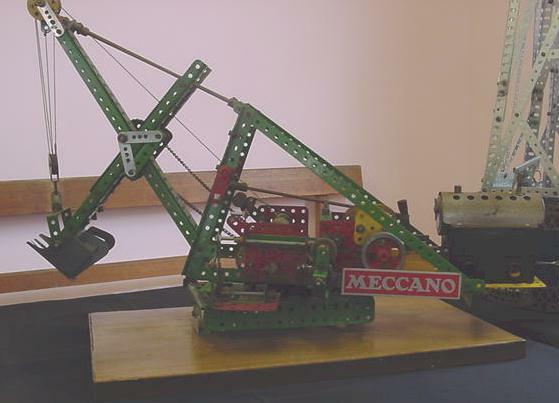 Steam Excavator built by the late Jack Nelson based on SML19a and modified to use the post-war Steam Engine. 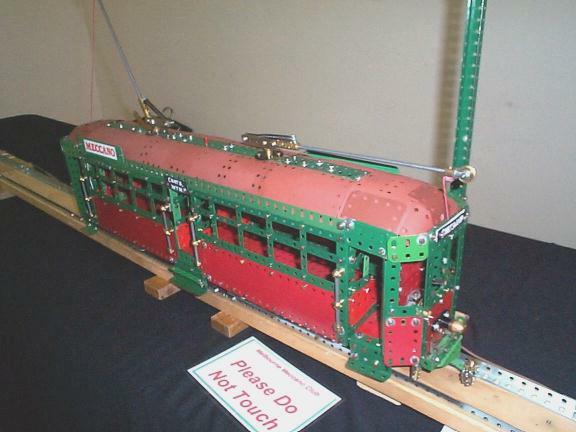 'The Lion' Locomotive built by Doug Ward from instructions in a 1970's MM. 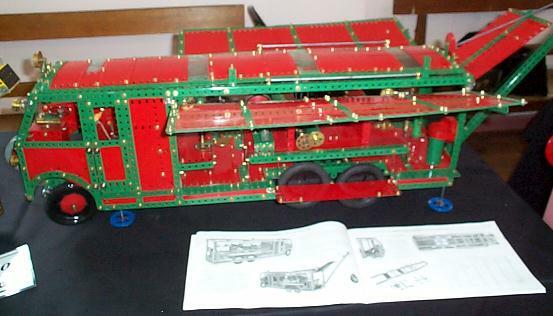 Mobile Workshop in red/green from the pre-war No 10 leaflet. Marine Engine from the No 9 red/green manual. 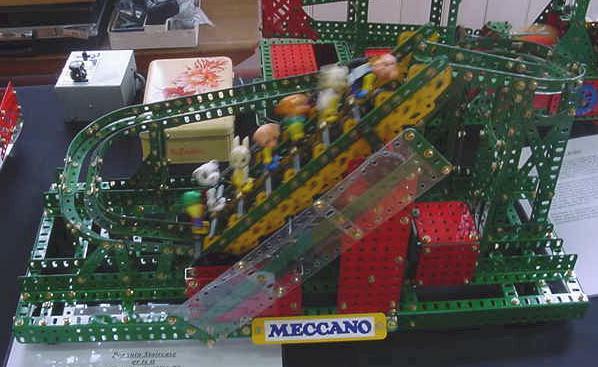 Peter During showed several models including a Vertical Press, a Diesel Electric Locomotive running on Meccano track and an operating Meccanograph. 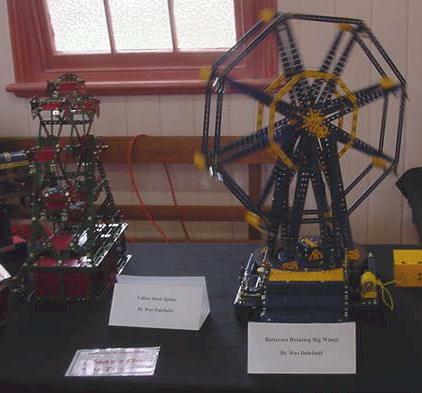 Steve Hatton's display comprised a collection of 5 models from the "Mission of the Universe" Set. These were: Space Base, Space Explorer, Detector Unit, Meta Cruiser and Defender Unit. 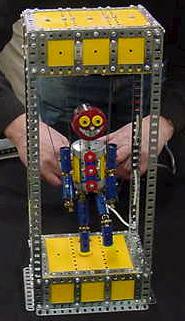 Graham Russell had several mechanical demonstration models taken from the Meccano Standard Mechanisms Manual. These included, levers and pulley blocks. 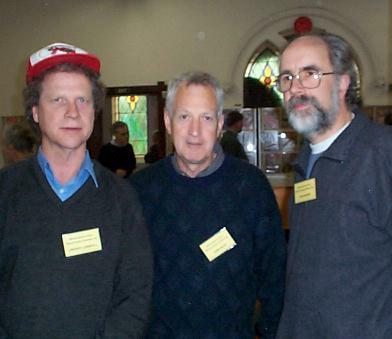 If only Frank Hornby had been there. 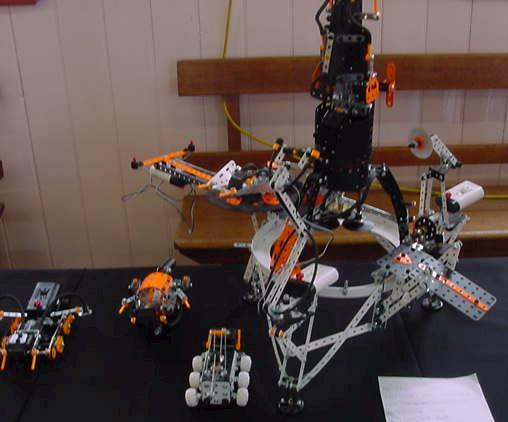 Graham Jost provided an imposing collection of models. 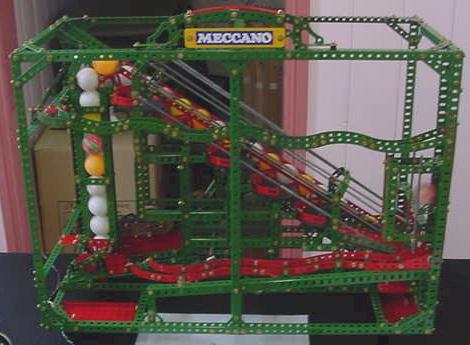 Partridge ping-pong ball roller, North Midlands Meccano Guild (NMMG). Penguin Staircase (modified with L*g* figures) (NMMG). 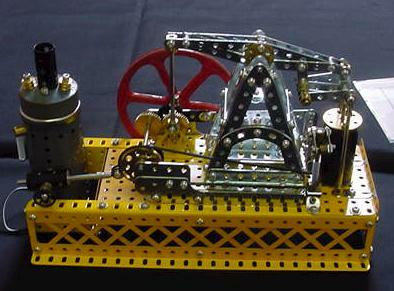 Stephenson's Rocket with a neat driving arrangement. 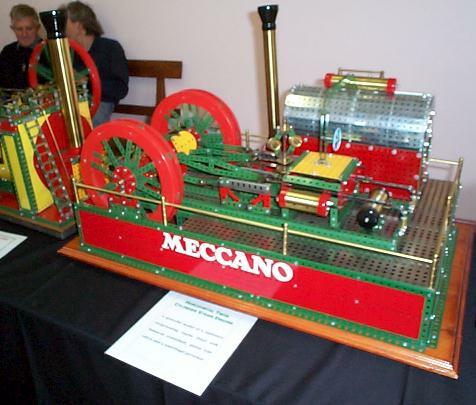 Locomotion No 1, 1825 based on model in MM 1978. 0-gauge Tank powered by a miniature Swiss geared motor housed in the boiler. Flying Machine from the Instruction Manual for the famous pre-WW1 No 2, or Trinity, Clockwork Motor. Horseless Carriage, designed by Don Redmond in Canada An attractive model powered by a Magic Motor. 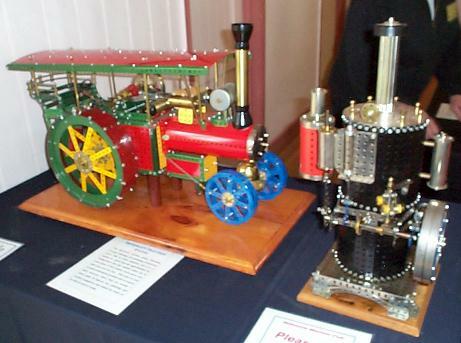 Showman's Engine designed by the late Brian Rowe. 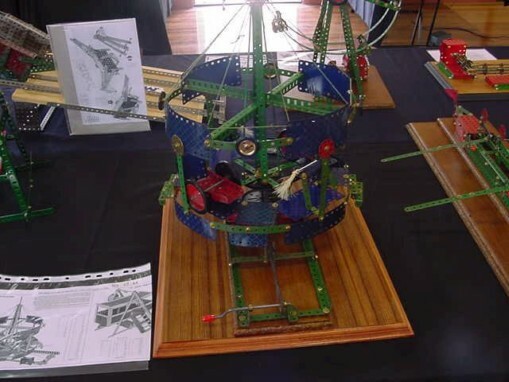 Helter-Skelter - one module of a complex Ball Roller, yet to be built. (Come along again next year). 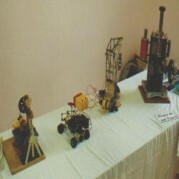 Kimball Monger had several models. A 1929 Douglas 700 cc Motor Cycle Combination Racing Outfit. 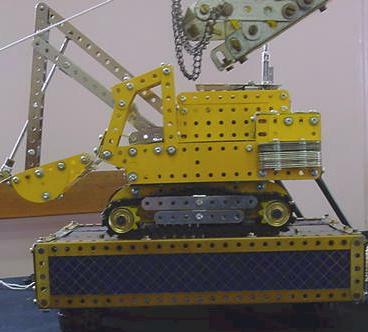 A Twin Drum Cable Ploughing Engine. "Riders in the Sky" - motor cycles moving around an elevated circular monorail. 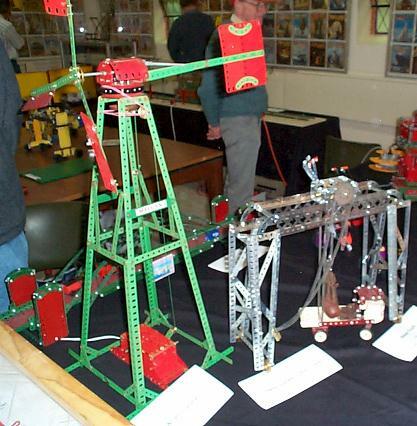 The model started as a tower crane (a disaster) but was transformed by inspired lateral thinking - an imaginative Kimball freelance model. Printing Machine - incomplete and not working. Not worth the effort of trying to build as the design is hopelessly inadequate according to Kimball. 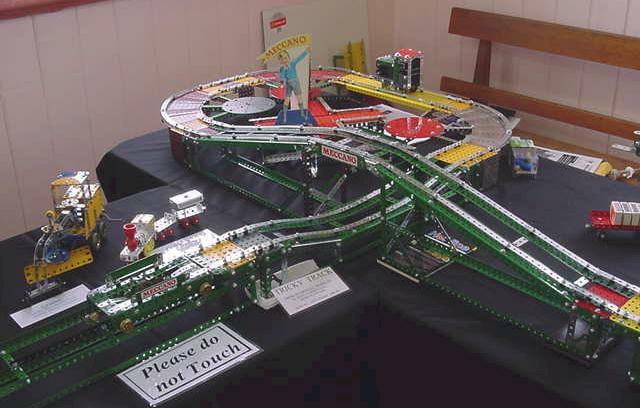 Dave Denner's "Tricky Track" ran faultlessly and amused our visitors with its operation around its track. Bruce Thompson's main contribution was the "Saturn War Cruiser" from the Space Set 2501 of the late 1970's as well as several small models. 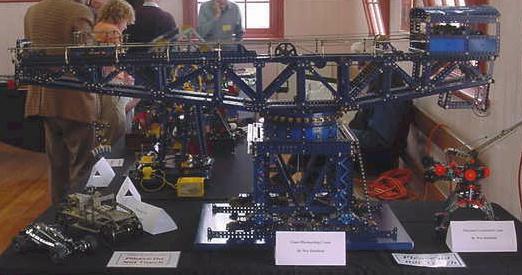 His magnificent Blocksetting Crane constructed using 1978 blue parts - a fine model Wes and deserving of the many complimentary comments I have heard about it. 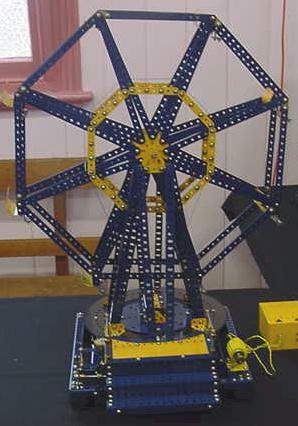 A Rotating Base Ferris Wheel again in 1978 blue/yellow, based on a prototype in Battersea Pleasure Park, London. 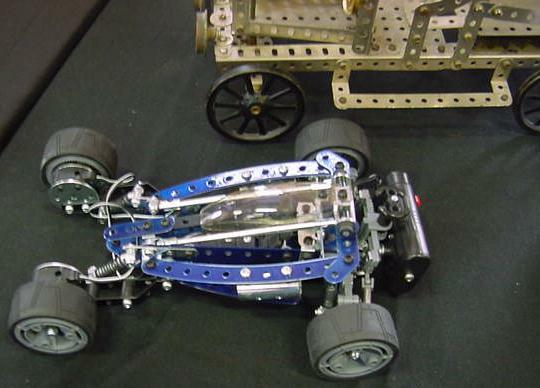 This model was adapted from the Dec 1957 MM Model of the Month. The Australian Yellow Back Spider (sounds like a Kiwi import to me, Wes). A motor car build in nickel parts from an early 1920's manual. Graham Jost once more did us proud with several contributions. Magic Windmill - rotates only in one direction, irrespective of which way the handle is turned. Schmidt Coupling - couples two parallel offset shafts. Zig-zag Slide believed to be a Konkoly model. Requires some careful setting up to get it working smoothly! 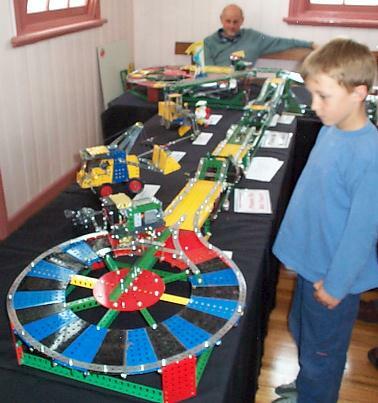 Novelty Reversing Mechanism seen in NZ. 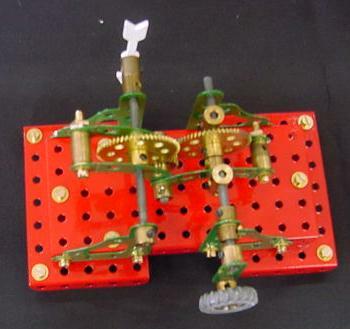 An elaborate Gearing Demonstration - which showed the operation of several mechanical devices simultaneously as the handle was turned. 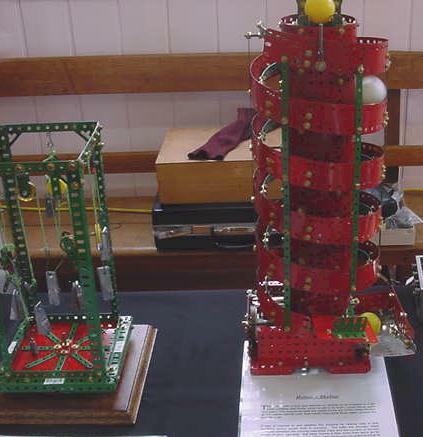 Graham Russell's contribution comprised 3 crank operated models from the No 5 red/green manual. Paul Johnstone brought his Swiveling Jib Crane from the pre-war no. 3 manual.